West Cumbria Rivers Trust 2016 Electrofishing Report - out now! Our first venture into an organised electrofishing project in 2015 saw the start of what has turned into a long term partnership with local angling interests on the Derwent. 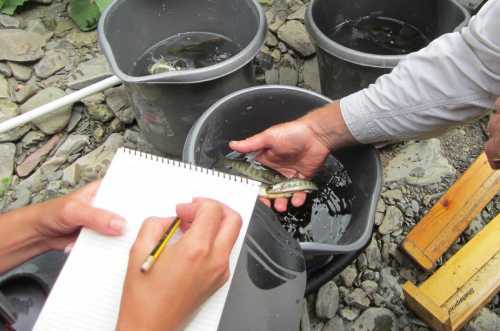 This work is crucial in helping us to develop records and a database of salmonid fry location and numbers whilst also providing detail of other fish species, populations and habitats found at each survey site. Going forward these regular electrofishing surveys will enable us to demonstrate fry population trends, while the systematic habitat surveys will allow us to determine the “catchment condition” (as termed in the report). The detailed database will prove invaluable in helping to identify opportunities for future investment in our catchment where it is most needed. It will enable us to develop a programme of essential habitat improvements which will be delivered through the “River Corridors Group” partnership (this partnership is the key remaining legacy from the Bassenthwaite Lake Restoration Programme). One interesting development to spring from this work is the concept of a “Catchment Tree” (think family tree and substitute relatives for rivers!) which has been worked up from an earlier concept within the Environment Agency. This Catchment Tree shows the full extent of the named becks and tributaries across the catchment with a view to providing a unique referencing system for all our survey sites. This will also provide a more detailed picture of opportunities for future surveys. If you spot any that we’ve missed you won’t get a prize but we would like to hear from you! Our Trust Director, Jodie, is currently investigating how the graphics of the existing basic presentation might be worked up into something more eye catching – maybe something modelled on the London underground map would have possibilities; let your own creative juices flow and let us know if you have any good ideas! 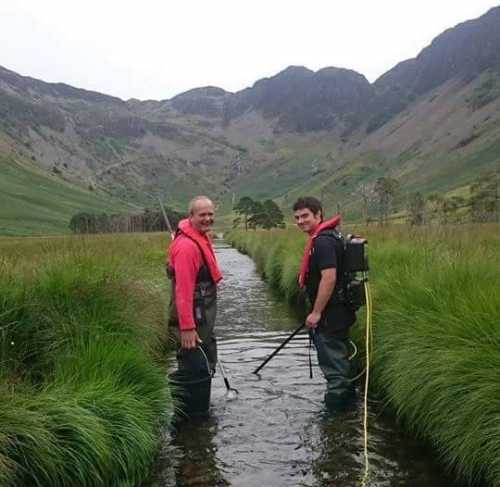 The project is wholly funded by fisheries interests from within the Derwent catchment, with WCRT staff acting as the full time focus for the field work with assistance from a growing band of enthusiastic local volunteers. If you’d like to join in then please contact the trust office. So there it is; 2015 was a great start for electrofishing surveys and 2016 saw the number of survey sites expand. We at WCRT are keen to see this concept grow to deliver an ever broader range of data over an ever increasing number of sites in future years. But the essential formula underwriting the whole enterprise is very simple: MONEY IN = DATA OUT! So please keep sending the cash! Thanks again to all those who contributed in the past and if your club or syndicate didn’t then please give someone a big push to get out their cheque book to help with the project in the future . Download a copy of our 2015 Electrofishing Report here!